I decided it might be best to keep the blog short this week. After all, you’re probably busy enough already, right? So let me just say this: Go ahead and enjoy the taste of the chocolates or the fragrance of the lilies or whatever other traditions you may have for Easter. Those can be good and fun and even meaningful. 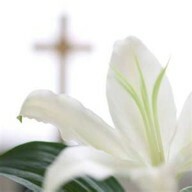 But remember, the whole point of this day is to celebrate the resurrection of Jesus from the grave. His death and resurrection mean victory for you and me! His death and resurrection give meaning and purpose to every aspect of life. This entry was posted in Scriptural Perspective and tagged 1 Corinthians 15, Easter, resurrection. Bookmark the permalink. What a wonderful thought, his resurrection breaths life into an otherwise meaningless faith! I’m enjoying his good gifts, from great to small this Easter. I trust you are as well. Enjoy that little granddaughter all frilly and sweet this spring!